It takes time to get [it] right. I don't want it to look anything but accomplished and if I can't make it look that way, then I'm not ready yet. The world's best manufacturers have developed an excellent reputation based on Total Quality Improvement. Superlative presenters have also developed their presentations and their reputations by using Total Quality Improvement. In this section you will learn how to take your presentations to the next level by maximizing the benefits from practice sessions and salient feedback. You will also learn how to develop the deep structure of your presentation and how to develop command (stage) presence - all of which are designed to lead the way to becoming an accomplished presenter. Practice! Practice by videotaping, audiotaping or role-playing with friends and colleagues. Be so comfortable with what you are going to say that you don't have to think about it. This frees your thoughts to be totally in tune with your [audience]. Simulate the setting and audience as closely as possible. Look at the presentation from a fresh perspective. Too often, presenters find that they have perfected a part of their presentation that shouldn't be in the presentation at all. Often, this comes as a result of overrehearsing component parts, without considering the presentation as a whole. A better strategy is to listen to the presentation from start to finish, even if it is in rough form. In fact, you may even want to video an early version. The purpose of taking a video is to get an overview of the presentation to determine what should be in it as well as what should not. By listening to an early version, you can begin to hear the central theme and the questions that the presentation should be answering. Because even the first draft of a presentation is enough to make people anxious, Harvard University's Joan Bolker uses the idea of "the zero draft" to help people with writer's block. In her book, How to Write Your Dissertation in 15 Minutes a Day, Bolker, like many other writers, says there is no such thing as a good writer; there are only good rewriters. Likewise, James Michener said, "I have never thought of myself as a good writer. Anyone who wants reassurance of that should read one of my first drafts. But I am one of the world's best rewriters." In fact, most experts agree that the better the document, the more likely it has been revised numerous times. It is the same with presentations. The better the presentation, the more times it has been practiced, and that means practicing early and often. However, the hardest practice session for many of us to get around to doing is the first practice session, and this is an all-too-common mistake. One of the best ways to get around this is to do "the zero practice session." We developed the idea of "the zero practice session" from Joan Bolker's recommendation to take the anxiety out of writing the first draft of a written document. Joan calls this "the zero draft." The purpose of the zero draft is to get words on paper or a layout of your presentation. The intended audience for the zero draft is you. So get something - anything - down on paper. Give yourself something to edit. You are purposely working out and clarifying your own thinking about a particular topic. Once you have a better idea of what you want to say, you can then decide if the material suits your intended audience. In other words, you have to figure out the answers to your own questions first. Then, and only then, do you work at figuring out the answers to questions your audience will likely have. Many times your questions and the audience's questions will be the same. Sometimes not. However, we often can't answer an audience's questions until we answer our own questions first. We have found that the concept of the zero practice session has taken a lot of the anxiety out of the preparation process. It has also helped us by giving permission to write and develop presentations in a manner that is more in tune with how presentations are naturally developed, and we have confidence it will do the same for you. Another way to ensure that you practice early and benefit from early feedback is to enlist selected friends and colleagues to listen to and give you feedback on your zero practice session. In this case, you should tell your audience that this is as much of a brainstorming session as it is a feedback session. You need to tell your audience that you want their ideas as to what should and what should not be included in the presentation as well as any other ideas they have, regarding both content and delivery. Participants in our presentations find they quickly improve and do a much better job when they develop and practice their presentations in small groups. Why is this true? They can test early and they can test often. This immediate feedback gives the presenter an idea much earlier as to whether an idea will work or not. When we ask our participants to give us an idea in percentages as to how much more effective this is, the normal estimate is 50 to 90 percent. Based on their experience in class, the participants are sold on using the "test early and test often" technique in the future. Testing early and often is a proven strategy, yet you may think it difficult to find a live audience to practice in front of. Not so. Focused presenters know that there are numerous places when you can practice. For example, you can recruit a group of friends or family members, or even practice in front of the family pet or capturing video via a smartphone. There are also organizations where you can find a willing and eager audience such as Toastmasters. There you not only have an audience to speak to, but the listeners will give you immediate feedback. This allows you to evaluate your presentation from your perspective as presenter, and to let the audience evaluate your presentation from their perspective as listeners. One of the reasons airplane simulators work so well is that they simulate actual flying conditions as closely as possible. Similarly, committed presenters should simulate the setting and the audience as closely as possible. For example, Sean saw Patricia Fripp present a closing keynote on the last day of the Global Payroll Conference in San Antonio, Texas. Earlier that morning, Patricia had practiced her presentation in the empty room where she would give it later that day - you just can't simulate the setting any better than that. Of course, you won't always have the opportunity to practice in the same room in which you will give the final presentation, but if you can practice in a room of similar size and setup, your performance will be better as a result. You may also want to consider practicing with an audience that will be as similar to your actual audience as possible. If you are presenting to professional engineers and you know several professional engineers, invite them to be your test audience. If you don't know people in the exact profession to which you will be presenting, find a practice audience that is as similar as possible to your target audience in terms of age, education, or interests. Dry runs are practice sessions and as such they can occur in a variety of settings. Dry runs will give you the time you need to make necessary corrections or to find and/or update any data, quotes, or statistics that you may be using in your presentation. Dry runs will also give you a sense of what is working and what is not working, and if there are any holes in your presentation. Also, after letting the outline sit for a while, you may be able to see that another way to organize your presentation makes more sense. Also, as discussed in the previous chapter, coming to the presentation fully prepared will help to alleviate much of the anxiety that plagues many presenters. Dry runs also give your subconscious a chance to work on the presentation when you are consciously not thinking about it. For example, you may be going for a run, folding the laundry, or driving your children to their activities, when presto, right in the middle of not thinking about the presentation, you have a terrific idea about how to use a story, a prop, a metaphor, or an analogy that makes your presentation twice as good as it would have been without the insight. Because the subconscious doesn't work on a fixed schedule, if you leave too little time between the preparation and the delivery, it is much less likely that you will benefit from any of these important insights. Different types of audiences will see and hear different things. For example, Sean had prepared a case study to be presented at a meeting of the Roundtable on the Economy and the Environment. The audience would be made up of members from government, the business sector, and environmental groups. Sean: I found a perfect case of an asphalt company that was located in a small community. The plant either met or exceeded all of the current environmental standards. The problem was that when the wind blew under five miles per hour, particles landed on a nearby elementary school and the students and staff complained that their clothes picked up the odor. A number of students complained of headaches. The mayor promised to move the plant before the next municipal election, but it was not determined who would pay for the move. Lastly, the head of the town's industrial park had asked for a vote, and the board of directors had concurred that the asphalt plant would not be allowed into the "high tech" industrial park. It was a perfect case because it was current, on-going, and seemed to have no solution that was agreeable to everyone. We had interviewed all of the constituents and made sure that we understood the case and all the proposed solutions. We painstakingly wrote up each party's instructions and made sure that we understood everyone's role as carefully as an FBI profiler and we developed a true scale map of the town and everything within the town limits and had verified with the town manager that our map was indeed accurate. However, there was one more step and that step was to do a dress rehearsal. I invited a group of friends over for dinner and, after dinner, asked our guests to try the case study with the directions for role-playing as we had written. I subsequently found out that my instructions, which were crystal clear to me and the people in the town whom I interviewed, were less clear to the people I had invited over to test the case. The dress rehearsal saved me from asking the members of the Roundtable to try to resolve a case where the instructions were less clear than I had thought. The moral of the story is to do a dress rehearsal and find out if there are any problems with your information, exercises, case studies, etc., before, not after, you give the presentation. It is a common experience to spend so much time looking at the material from the same perspective that we can't see any other way to present the material. Sean This is analogous to me losing my glasses. I know they are somewhere in the house, and I have searched high and low and can't find them. I then ask one of my children if they have seen my glasses and they find them almost immediately because they are approaching the subject from a fresh perspective. If you have a neutral outside party look at your presentation, that person may be able to see things that you don't see. This is especially true if you are presenting to mixed audiences where some of the members are very familiar with the material and others only have a slight understanding of the material being presented. Your material has to be so masterful that it reaches audience members who are extrinsically on different levels. You can maximize the value of your practice sessions by harvesting maximum salient feedback - our next topic. Oh, that God would give us the gifts to be able to see ourselves as others see us. Salient feedback is feedback that is so personally meaningful that we actually change our behavior. The problem is that even though we live in a feedback-rich world, most of us do not harvest the feedback necessary for total quality improvement. We will present 12 methods to ensure that you are getting the feedback necessary to put you squarely on the road to becoming the best presenter possible. There are many techniques that will help you get the feedback you need from those who have seen you present. A good evaluation form given right after the presentation will give you some indication of how well you presented. If you use the same evaluation form over time, you can gauge progress and the effect of changing an element of what you present or how you present. There are almost as many types of presentation evaluations as there are presenters, however, many presentations are not evaluated at all. Presenters who fail to evaluate their presentations miss out on valuable feedback. We have found that even masterful presenters who have a great deal of natural talent will eventually present less well than their less talented counterparts who have specifically sought out and benefited from constructive feedback. We favor using scaled items (to help measure between presentations) and open-ended items to get a deeper sense of how the participants reacted to the presentation and to individual differences. Two things to keep in mind when you use these types of evaluations: You can't please everyone, and extreme scores can bias the ratings. The 3 � 3 Feedback Form. The "A Penny for Your Thoughts" Evaluation. Be Vigilant for Opportunities to Maximize Feedback. Seek Feedback from Spouse, Children, and Significant Other. The Results Achieved Over Time Evaluation. The 3 � 3 Feedback Form is designed to help you get more systematic feedback on what you do well as a presenter, in addition to providing targets for improvement. It solicits feedback in threes: three things done well and three areas in which to improve. Research has proven that we tend to be poor observers of our own behavior and that we become much more accurate when we have a systematic method of data collection. In addition, we get much more accurate feedback by asking at least three different people to rate us. There are a number of criteria to consider when choosing the people who will respond to the form. You need to choose someone who is both free to and capable of giving you honest, direct, and straightforward feedback. There are three reasons for starting with positive feedback: 1) It is important to be acknowledged for what we do well - no one in any of our training sessions has admitted that they suffered from too much positive feedback; 2) Behavior that is acknowledged and reinforced tends to occur more frequently; and 3) Positive feedback is often instrumental in helping us develop the focused motivation necessary to work harder in areas where we want to improve. Please list three specific things I do well as a presenter. For example, "Pat is a good presenter," is not specific. "Pat uses creative and unexpected visuals to anchor her points both aurally and visually," is specific. Please list three specific targets for improvement. For example, "Paul needs to add more impact to his presentation," is not specific. "Paul needs to develop high-impact introductions and test his introduction with a focus group," is specific. Lastly, an alternative method of data collection is to ask a neutral third party to collect the data for you and then present you with a summary of the data in such a way that no specific respondent could be recognized. The most common evaluation is an evaluation given immediately after the presentation. The evaluation will vary in length and level of complexity depending on the extent and intricacy of the presentation. We like evaluations that are both quantitative and qualitative. Quantitative evaluations allow you to see if you are making progress over time. Qualitative evaluations allow you to get information that is more idiosyncratic about the content of the presentation, what your audience enjoyed, what they learned, and specific targets for improvement. An example of this type of evaluation is presented in Figure 7-2 below. Please list any suggestion you have for improving this presentation. What other presentations could we offer to support your continuing professional development, follow-up on this program, or apply what you have learned? Each participant is given five pennies. At the end of the presentation, or possibly at the end of the first day of a multiple-day presentation, the participants can rate the value they derived from the presentation by putting a portion of their five pennies into a jar. For example, if they got relatively little from the first day, they would put in one penny. If they received a great deal of value, they could put in four or five pennies, and so on. The following day, the instructor can either report the total number of pennies he or she collected in the jar, or work it out proportionally out of 100. As an example, assume there are 15 participants, each with five pennies, and at the end of the day there are 60 pennies in the jar. The instructor could say that on day one, the participants received 80-percent value (60 out of 75). Participants find this a fun activity. It also gives the instructor a good use for his or her "leftover pennies." The only drawback from this form of evaluation is that it does not tell the instructor what is working and what is not, but it can be used to start a conversation on feedback, for what worked well and what needs improving. The Post-it Note evaluation can be done by itself or in conjunction with the "A Penny for Your Thoughts" evaluation. For the Post-it Note evaluation, you will need two different colored Post-it Notes no smaller than 3 � 3 inches. Let's assume that the first color is green. Each participant is asked to write down on the note up to three things that worked well in the speaker's presentation. If the second color is yellow, the participants would write down up to three suggestions for improvement on the yellow Post-it Notes. On the way out, each participant can put his or her notes in a designated area such as on a flip chart. This evaluation gives specific feedback on what worked and what needs improving. If you are giving a multiple-day program, you can use a form that is similar to The Daily Evaluation Form found in Figure 7-3. List several points / items you found useful today. List any areas that require clarification or need to be reviewed. These evaluations can be used to start off the next day's session as a review, by highlighting items that the participants thought were particularly important, and by discussing those items that needed further clarification. An excellent way to get highly focused feedback is to do an e-mail survey where you ask only one or two questions. You can e-mail 10 to 20 people who have heard you speak and ask them to tell you what they perceive as the most unique aspect of your content. Or you can ask them to tell you the most unique aspect of your presentation style. The purpose of this exercise is to receive as highly focused and specific feedback as possible, and for that reason it is better to ask only one question at a time. Sean asked 10 people what they most liked about his presentation style and five factors came back. One of the most interesting was the feedback he received from Jonathan. Jonathan said that he was very impressed with the way Sean used analogies, that is making something more understandable by relating it to something that is already well understood. 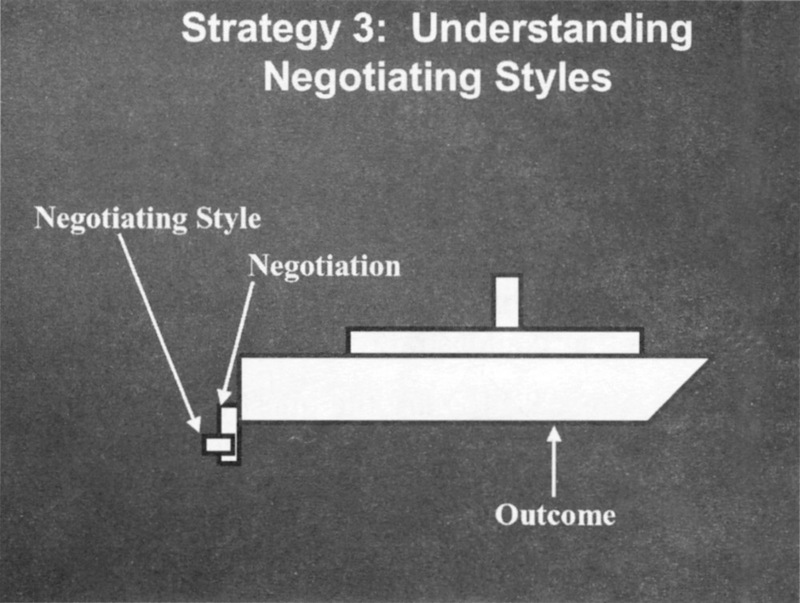 The example that Jonathan related was using a trim tab (Figure 7-4) to help people better understand the leverage that can be gained from better understanding one's negotiating style. Sean: Although I realized that I used analogies, it wasn't until Jonathan pointed it out that I realized how powerful they were. I also vowed to improve my use analogies more consciously and to ask audience members for more specific feedback as to whether the analogy I used to help answer a specific question was helpful. When soliciting highly focused feedback, it is easy to vary the question. If you use a lot of humor, you can ask them the most unique aspect of your humor, or what they most like about your voice, your use of props, transitions, or PowerPoint slides, and so on. The value of this question is that it focuses entirely on one aspect of your ability to present: the feedback is highly focused and decidedly useful. "Shows genuine concern and interest." "Identifies and focuses on reducing our worry list." "Looks for opportunities to empower us." "Establishes and maintains a non-threatening environment." "Looks for opportunities to provide and get feedback." "Says what he is going to do and then does it." "Tells stories that demonstrate and reinforce trust-building." As you can see, it is easy to vary the question. If you use a lot of humor, you can ask your audience what is the most unique aspect of your humor, or what they most like about your voice, your use of props, transitions, or PowerPoint slides, etc. The value of this type of question is that it focuses entirely on one aspect of your ability to present, and therefore, the feedback is highly focused and decidedly useful. Design a question on which you would like to get highly focused feedback. Then list the people you can solicit this feedback from. Video feedback is one of the best sources of feedback presenters can get. The problem is, no one likes the way they look or sound on video. A frequent comment is, "But I don't sound like that!" Yes, you do. The tape is a more accurate indicator of how you sound to other people. Remember, the voice that you hear when you speak is how it sounds in your head. You are "hearing" the subtleties and nuances that your brain intended. The audience is not privy to those intentions, so all they hear is the sound waves that fall on their ears. Our advice is to video yourself, grit your teeth, and listen to it. If you don't like what you hear on the video, there is a good chance that the audience may be thinking the same thing. You can play it for others to obtain their feedback and impressions. You can try various presentation strategies and techniques and compare them. You can capture not only what you say, but also how you say it. You can immediately see if your body language is congruent with your verbal presentation. Audio and video feedback is important for all aspects of the presentation, and it is especially important for the beginnings and endings because they carry such weight in the presentation. Remember, 25 percent of the impact from any presentation is from the beginning, and 25 percent is from the ending. Sean: One night, as I was preparing for a presentation, I asked my son to capture a video of the beginning, the ending, and one section from the middle that I was not happy with. Based on seeing the video, the beginning was excellent. I saw clearly how to strengthen the ending. But I was still stuck on how to make that troublesome point in the middle work. I tried three variations before deciding on a fourth (which combined elements of the other three) before I was happy with it. As an added bonus, my son now has a much better understanding of what his Dad does for work and his younger sister has already volunteered for the next time I need a cameraperson. If the cameraperson also knows a great deal about presentations and/or the content of your presentation, you can also benefit from his or her expertise. One point to remember is that you also benefit from feedback from people who don't know the content area, especially if you will have people attending the presentation who are not familiar with your topic or content. In other words, to increase the validity of this exercise, you should consider asking your "coach" to be as similar to the presentation audience as possible. Another advantage of taking a video of presentations is that you can capture those special moments when something wonderful happens by surprise. Victor Borge, one of the great entertainers of all time recorded every single performance. Why? He said, "Because I never know when I might say something funny." The component parts analysis is an evaluation of the individual components that make up your presentation. The component parts analysis will help you get a good sense of what parts of the program are working well, what parts need to be improved, and what ones need to be eliminated. Examples of component parts are: exercises, activities, stories, and visual aids. The beauty of a component analysis is that it will save you from erroneous assumptions. Sean has given a presentation for several years on dealing with difficult people. In the presentation, he shows a film that he was getting tired of using and had planned to remove from his presentation. However, when he performed the component parts analysis, participants rated it as one of the most highly rated parts of the presentation so it remained as an integral part of the course. What will be very helpful is how the components are rated. You may find that the participants in general do not rate one of your favorite exercises nearly as favorably as you thought they would and you may, in fact, make the presentation much more effective by eliminating that exercise and replacing it with something that the participants find much more effective. Conversely, you may find that a part of the presentation that you don't like or, as in Brad's case, have grown tired of, is rated as one of the most valuable aspects of the presentation. Warning:�Our experience indicated that there is usually more discrepancy in how well or how poorly individual components are evaluated than there is when the participants evaluate the presentation as a whole. That is to say, the ratings of the components are usually significantly lower than the rating for the course as a whole. We believe this is because different components have a greater or lesser appeal to the participants than does the course as a whole - so don't be surprised or put off if the ratings for the components are lower than the ratings for the full program. An example of a course component parts evaluation appears in Figure 7-5. Note that this is a components evaluation that was designed for our particular course. You can build your own form by removing our examples and substituting your own. Exercise 1-2: The characteristics of the best and worst teachers I had in school. Understanding the four learning styles: theorists, reflectors, activists, and pragmatists. Identifying your purpose and the film clips used to illustrate ITEM: to Inform, to Touch the emotions, to Entertain, and to Move to action. Mind mapping using the TRAP model to reach each of the learning styles of your audience members. The use of games to make it both fun and memorable. The two-voice exercises: Moses Supposes and "This is the best presentation I ever attended" exercise. Would you recommend changing any of the components? If yes, which ones? How would you recommend changing them? Do you have any additional suggestions regarding the components of the course or the way in which they are structured? However, you don't have to wait for the end of the presentation to do a component analysis. You can do an instant component analysis. There is an easy and fun way to get feedback on any of the components, new or old. We introduced a new exercise to a group of participants in our presentations course. The exercise was to develop a mind map for one section from this resource. Participants then developed a presentation based upon their mind map and applied the TRAP model (theorists, reflectors, activists, and pragmatists) to their presentation in order to make the presentation applicable to the learning style of the members of their audience. They were instructed to use a different colored marker for each learning style. The beauty of using different colors is that the presenters get immediate feedback on how balanced their presentation is. For example, if green is the color that represents ways to involve the theorists, and there is hardly any green on the page, then the presenters know that they may need to develop more ways to involve the theorists in their audience. The participants then explained their mind map to the whole group. For example, one participant explained how he would make "the buddy system" attractive to theorists as well as to reflectors, activists, and pragmatists. After completing this exercise, Sean suspected that his instructions were not clear enough nor was the time that had been allotted for the exercise sufficient. So he decided to do an Instant Component Analysis. He then asked each participant to fill out a yellow 3 � 3 inch Post-it Note on what worked in the exercise and to rate the exercise on a scale from 1 to 10 where 1 "didn't work" and 10 "worked very well." He also asked them to fill out a pink note on what would have made the exercise better. When they finished, they were asked to affix their Post-It-Notes on the flip chart paper that had "What Worked?" at the top and "What Would Make It Better?" written in the middle. After the exercise, they took a break. When the class started again, Sean reviewed the feedback. The average rating for the effectiveness of the exercise was 8.6. Typical comments of what worked and what would make it better are illustrated in Figure 7-6. Reading the assignment as homework and then designing the presentation as the first task in the morning. Got everyone interested and involved. How the map helps with actual presentation. Combining the techniques forced us to understand rather than just recite the elements. Moving from practice or theory into reality. Implementing TRAP and mind mapping helps in organizing ideas in presenting. Seeing how different teams approached the problem. Seeing how to get ideas across visually. Teamwork in preparation and relating brainstorming ideas to the TRAP definitions. Team participation, hearing other people's views on the same topic. Add 10 minutes more prep time for the in-class exercise. More time to prepare a suitable presentation, that is, the last thing you do on Day One is the mind map - first thing we do on Day Two is the developing and presenting the presentation. More rehearsal on our part. Using the techniques to solve an actual problem (case) would be more effective. A second exercise to enforce what we have just done. Although, I think this exercise worked well. There is one more way to use an instant component analysis. If the presentation has 10 parts, and if you give the presentation frequently, you can evaluate a different component each time you give the presentation. By the time you have given the presentation 10 times, you will have evaluated each component. Both the quality of this feedback and the quantity are absolutely guaranteed to improve your presentation content and style of delivery. In summary, instant component analysis is one of the easiest, more immediate, and most fun ways to elicit that feedback. And as presenters, we learn how to make the presentation more interesting for both the participants and ourselves. There is a scene from the movie The Sixth Sense in which Haley Joel Osment plays the role of Cole, an 8-year-old boy, and Bruce Willis plays the role of Malcolm Crowe, a renowned child psychologist. The scene opens with Cole standing in the entryway of his house and Malcolm sitting in the middle of the living room. Malcolm tries to get his young patient to open up to him by wisely asking Cole if he would like to play a game (games are the natural language of children). The essence of the game is that Malcolm will try to guess what Cole is thinking. If Malcolm guesses correctly, Cole will take a step closer, and if Malcolm guesses incorrectly, Cole will take a step back. If Malcolm guesses correctly enough, Cole will sit down and they will have a conversation, if he does not guess correctly enough and Cole reaches the front door of his home, both the game and the session are over. One of the many things that is so intriguing about this scene is that Malcolm has set it up so that he gets immediate feedback as to the accuracy of his perceptions about Cole. Likewise, self-aware presenters are vigilant for opportunities and develop methods to maximize the feedback that they receive. This ability is clearly demonstrated in the following two examples. For presenters striving to succeed there are no obstacles or excuses that stand between them and their goal of maximizing salient feedback. Sean was presenting a keynote for a conference in Ottawa. He was the keynote speaker on the second day. Janet Laap was the keynote speaker on the first day. Sean had arrived a day ahead of his presentation to get a good sense of the conference and to tie his remarks into both the conference in general and to Janet Laap's comments in particular. Sean: I was waiting to talk to Janet at the end of her presentation. There was a long line ahead of me, so I decided to listen to the questions and Janet's answers as I waited. Three things particularly impressed me: 1) the number of people who stood in line to speak to Janet; 2) the quality of her answers; and 3) how aggressively she asked for salient feedback at the end of the presentation. I used the word "aggressive" here in a very positive sense. I also heard the quality of the feedback that Janet received. Watching Janet reinforced my dictum that we live in a feedback-rich world. Most of us do not "harvest" the feedback that exists. Aaron: I have found audience feedback has risks as well as rewards. The rewards come in the form of affirmation that you connected in the manner in which you intended, coupled with legitimate suggestions of how to make your points better. Every talented presenter depends on this kind of feedback. This is how we grow. Yet there are risks in processing feedback as well. Some people are simply poor listeners. Therefore, if you try to adjust your presentation based on the comment of someone who clearly misheard or misinterpreted you, you could end up trying to fix a problem that doesn't exist, except in the mind of one poor listener. This is another reason why videoing yourself is so important. If an evaluation that says you said something, you can go to the video to verify or refute the feedback in question. Write down three opportunities that exist for you to receive more feedback about your presentations. It was potentially one of the most important presentations of Brad's life. He was flying to Toronto to give a presentation to Meeting Professionals International. MPI is the world's largest association of meeting professionals and one of their primary responsibilities is to organize meetings and conventions. If he did a good job it would increase the likelihood that he would give more presentations and keynotes. To add more pressure, the potential publisher of his newest book was coming to hear him present. If he presented well, it would dramatically increase the likelihood that he would get the contract; if he did not present well, the contract was history. Sean: I had already booked our family's annual Easter weekend retreat at Nova Scotia's beautiful White Point Beach Lodge. There were many wonderful activities that the children could engage in and there would be lots of time for me to refine my presentation, practice it, and record it. Although I really liked the introduction, exercises, the transitions, and the ending, there was a part in the middle that I just wasn't happy with. I asked my children - Katie and Andrew - to listen to parts of the presentation, which included the part I wasn't happy with. Surprisingly, they both thought it was quite good. However, when it came to the part in the middle, Katie suggested that I change the order of a few of the words and that I add some increased emphasis and vocal variety to the parts I was having the most trouble with. Her feedback was right on. This once again proves that we live in a feedback-rich world, but most of us, however, do not do enough to harvest the feedback that exists. Aaron: Seek advice from many; accept advice from few. As I went to various Toastmasters clubs to practice for a high profile speech contest, on two specific points I heard constant and unanimous criticism. I had learned that the quickest way to please no one is to try to please everyone, so with each rehearsal when criticism on those two points was raised, I thanked the evaluator for his comments and then promptly told myself, "This is not negotiable." I then turned to my most trusted advisor, my wife, Beth. She, knowing me better than anyone else, said, "Yes, this is who you are, and this is right for you." The lesson was clear: Turn to people who know you best for the best advice. It is all well and good to find out that the participants enjoyed the presentation and that all of the presentation's components worked. However, the acid test is whether the presentation had a long-term impact on the "bottom line," the corporate culture, or whatever the desired goal was of the presentation. This is the most important and the most difficult-to-measure form of feedback. But measure it we must if we are to objectively determine the ROI (return on investment) for doing the presentation. One way to get some of this data is to survey the people who attended the presentation and ask them for tangible proof that the materials that were presented have, in fact, been put into practice and have made a positive difference to the attendees and/or to their organizations. To better determine the long-term effects of the presentation, conduct a survey three months, six months, or a year after the participants have attended the session. You can ask some general questions about what the participants remember and what they have been able to use, but you should also ask specific questions regarding how well the material presented has transferred to the participants' actual work setting. The following figure is an example of a post-presentation evaluation form. At this point, do you have any suggestions for improving the presentation or its effectiveness? Aaron uses what he calls the 10–80–10 rule: 10 percent of any audience will like anything you do, and 10 percent will dislike anything you do. It is the 80 percent in the middle to whom you are really speaking. If you focus on either of the 10 percent groups at the extremes, you will likely not connect with the majority of your audience. If you give too much emphasis to those in the 10 percent segments, the feedback you receive may be skewed. For example, at the end of the spectrum in which the "negative" 10 percent reside, though their suggestions for improvement may be valid, it is possible that the motives behind their criticism are mixed or mean spirited. We have found that the best way to deal with the latter type of criticism and still maintain or enhance your credibility is to summarize the evaluations and ask the meeting planner to send out a copy of the evaluations to all of the participants. This allows the dissenters to see how their criticism stacks up with the majority of the participants. One excellent technique to mitigate against the effects of extreme scores is to use Olympic scoring. In Olympic scoring, you throw out the highest and lowest scores and then average the remaining scores. Olympic scoring eliminates the fact that one unusually high or low score can bias the average, which gives a result that is closer to the true mean score (see Figure 7-8). For example, if there are fewer than 30 participants, and if one score is either much higher or lower than the average, then that score can radically skew the average ratings for any particular question. It is for this reason that we recommend Olympic scoring with groups of 30 or fewer. To use Olympic scoring, you simply list all of the scores for any particular question and then cross out the highest and lowest scores for that question. By using this process, you get a truer approximation of what the real rating should be and it is not subject to extreme scores as demonstrated below. The advantage of asking the same questions all of the time is that you have a consistent yardstick to evaluate how you are doing. The advantage of changing the questions is that you can receive different information, which can be very informative. You can also ask questions you previously had not thought necessary to ask or didn't have room to ask. Our best advice is to be consistent in your evaluation questions until you get relatively consistent feedback. Then consider varying the questions from time to time to see if you can elicit different feedback on different aspects of both your content and your style. Send copies of the evaluations to the participants. Whenever possible, we send directly or ask the organizer to send participants copies of the evaluations to reinforce the learning and to show the participants that we take their remarks seriously. A copy of the letter we use is reproduced in Figure 7-9. We have enclosed the evaluations from the Presentation Strategies course as an attachment to this document. We were pleased with how hard the participants worked at mastering the material. We ask that a copy of these evaluations be sent to each participant as it helps to reinforce what was learned during the presentation and it also demonstrates that we take their feedback seriously. Lastly, we must tell you that we are impressed with the professionalism of the participants and the feedback they gave us for improving the course. Sean: In terms of asking the participants for salient feedback as they leave the session, I have never seen anyone do it as well as Janet Laap. As I was in line waiting to congratulate Janet on her phenomenal presentation, I couldn't help but notice that she asked the people who were waiting to talk to her how they liked the presentation and what she could do to improve it. The amazing thing was that Janet really meant it. For her, it was not just a perfunctory remark; she deeply and sincerely wanted their feedback on how to improve the presentation. Remember that a vague comment like, "Should there have been more examples?" is not as helpful as asking specifically what kind of examples the person would like to see in the presentation. Also, ask the person's advice as to what should be taken out. Lastly, you can't incorporate everyone's feedback. By trying to please one person, you many displease three others or as Aaron says, "If you try to please everyone, you'll please no one." Therefore, all of this feedback needs to be balanced. It is also important to find out what the audience liked about the presentation and to note what you should do more or less of. These evaluations can also be used to start off the next day's session or your next presentation to the same group as a review, by highlighting items that the participants thought were particularly important and clarifying or discussing those items that needed further explanation. In addition to maximizing their use of salient feedback, there are two last characteristics that differentiate consummate presenters from their less accomplished counterparts: 1) knowing the deep structure of your presentation, and 2) stage presence or command presence. The best way to understand what we mean by deep structure is to use an analogy of stem cells. Stem cells have the amazing ability to transform themselves into any type of tissue or organ. Similarly, knowing the deep structure of your presentation means that you know your subject so well, and how each segment of that subject relates to each part of your presentation at the deepest level possible, that the presenter has the ability to change the presentation "on the fly" based on the immediate feedback he or she is receiving from the audience. For example, if the presenter perceives that there are more pragmatists in the audience, the presentation automatically becomes more pragmatic. This is called "attunement" - the audience and presenter are mutually attuned to each other's needs, wants, goals, and desires. Then, for example, when you are asked a question, you are able to come up with just the right example, story, simulation, metaphor, and/or research study to best answer that question. When the deep structure is just right, all of the elements of the presentation work together perfectly. Polished presenters also use the deep structure to help make their sub-audiences into one unified whole as the following examples point out. In Olympic figure skating, a perfect score from the judges is 6.0 in two categories: technical merit and artistic impression. Les Brown achieved perfect 6.0 from all those in attendance in both technical merit and artistic impression at the National Speakers Association 2000 convention in Washington, D.C. Not only was his presentation one of the most masterful presentations that Sean has ever had the pleasure of seeing, Les stopped at critical points in the presentation and told the audience exactly how he crafted each element of his presentation and then fully explained the "why" behind the "how." The first lesson Les Brown taught was that our audience is really made up of sub-audiences and that your job as a presenter is to make that audience into one unified whole. When you, as a presenter, enter a room your audience is divided by the amount of energy they have, their ability to attend to the presentation depending on how many other things they have going on in their lives, by gender, by income level, by race, and by how predisposed or prejudiced they feel towards you and the topic you are presenting. As presenters we have to make that collection of sub-audiences into one unified audience - and transforming disparate audiences into one audience is Les Brown's fort�. The three techniques that Les had mastered to making disparate audiences into one audience are: the use of quotes and affirmations, making a commitment, and affirming that commitment by shaking the hand of the person sitting on your left and right. Early in his presentation, Les asked the audience to speak aloud the words to a powerful quotation. Hearing Les's voice intermingled with the members of the audience's voices was very powerful. The words were powerful and the chorus with the audience hearing itself made them more powerful still. Think of the powerful words from Martin Luther King Jr.'s speech, "I Have a Dream." In your mind, hear Dr. King say those words. Now hear the same words spoken by Dr. King while being echoed by the thousands of people in his audience. To connect with your audience rather than merely speaking to them, Les suggests that when you make a profound point, you hammer it home by asking the audience members to shake hands with the person on their left and state their intention to, for example, make a meaningful difference. Then ask the audience members to shake hands with the person on their right and again state their intention to make a meaningful difference. This has a wonderful effect of bonding each person with the person on their left and right. The audience members can also hear this same activity going on in the background all around them. What you can hear, if you listen carefully enough, is that all of the sub-audiences in the room are in the process of becoming one unified audience. We have never heard anyone do this better than Les Brown and you can hear it too by listening to his CD Presentation Magic by the Motivator. A second example is how Harold Taylor unifies his audience with humor, using his hilarious wit to poke fun at himself. Soon everyone is laughing, and at the same time hearing everyone else in the room laughing serves to unify his audience. We use surveys and ask the audience to raise their hands in response to one or two pertinent questions such as, "How many of you would like to double your effectiveness as presenters?" or, "Raise you hand if you let your own personal fear keep you from being as powerful a presenter as you would like to be." When the people in the audience see that everyone is grappling with the same questions and concerns, it has a profound unifying effect on the audience. They can see that there is more that unites them than divides them. One note of caution: This technique can be overused. It only works well if you ask a powerful or profound question. A Powerful or Profound Question. List any techniques that you have observed or used to unify an audience. Next, outline at least one technique that you will use to unify the audience in your next presentation. The result of knowing your deep structure, making sure that all of the elements in the presentation work together perfectly, and making your sub-audiences into one unified whole is flow. In summary, if you want to be an excellent presenter you must know the deep structure of your presentation - not only what elements are contained within, but how and why they fit together so well. Command presence is a term that was developed in the military to describe someone who had the quality of a leader, especially those who would be leading soldiers into battle. The term has since been generalized to business and other settings. Command presence is an elusive quality, but you know it when you see it. Command presence takes place when you walk into a room, office, or any situation and you realize that there is someone who is in charge, even when he or she is not formally in charge. Command presence is communicated both verbally and nonverbally. It is an elusive quality, partly because the whole is greater than the sum of its parts. For people who have it, their personality and charisma fills up the room. Sean: When my daughter was 8, she was in a ballet class. I remember going into the class and sitting down on the floor with some of the other parents. This ballet teacher had 16 8-year-old students and the attending parents' total attention. As I watched the ballet teacher demonstrate the steps she wanted her students to emulate, I remember thinking that not only did she have the attention of everyone in the room, but also, that she was a remarkably tall woman. I was shocked when I stood up at the end of the class, to see that this remarkably tall woman was in fact, rather short. Her command presence augmented both her physical and psychological stature. Some political leaders, such as Winston Churchill were able to use command presence to help change the tide of history. Other leaders, such as Martin Luther King Jr. and Desmond Tutu, were able to use command presence to change society. Some movie actors have developed it. Watch Paper Chase with John Houseman or Mandela and DeKlerk, where Sydney Poitier as Nelson Mandela and Michael Caine as DeKlerk, give unbelievably masterful performances as examples of towering command presence. You can also watch Martin Sheen in the television show The West Wing where just the way he walks into a room demonstrates command presence. For actors and presenters, command presence is called stage presence. You can get a strong sense of stage presence in the world of professional speaking by seeing or listening to Tony Campello, Jeanne Robertson, Marcia Steele, Les Brown, or Peter Legge who, within 10 seconds of beginning to speak, demonstrate command presence. In summary, command presence radiates a sense that the people who possess it are comfortable with themselves and they have a strong sense of who they are and what they represent. They also have the energy level, vitality, and ability to inspire people to dream of a better future by changing the way they think and moving them to action. One of the most important things aspiring presenters can do is to develop their command presence. One of the first steps is to do an honest inventory of where you have command presence and where you need to develop it. First, you can observe people who have command presence and notice how they behave. Second, you can interview people who have command presence and ask them how they developed it. Third, you can ask for feedback on your command presence and they must be honest enough to tell you the truth. The following exercise has been designed to help you develop your command presence. Please make three specific suggestions of things you could do to increase your sense of command presence. Total Quality Improvement is a continuous process requiring constant analysis, assessment, and adjustment. Just as the world's best manufacturers use Total Quality Improvement to improve their products, skillful presenters depend on the 12 techniques in this section to help them develop and implement their goals, and improve and enhance every presentation. However, there is one more thing that talented presenters do to continually improve the skills and strategies as a presenter by setting a lifelong goal to become a lifelong learner. It is to this last factor that we will now turn our attention.